Chris Brubeck: electric bass, bass trombone; Dan Brubeck: drums, hand drums, percussion; Mike DeMicco: guitar; Chuck Lamb: piano. 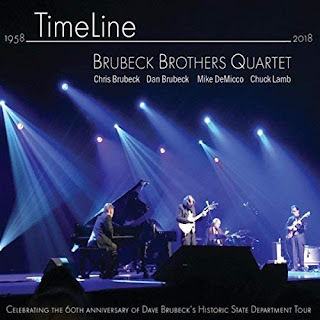 This album by the Brubeck Brothers—led by Chris and Dan Brubeck, sons of legendary pianist Dave Brubeck—commemorates the 60th anniversary of "President Eisenhower's Special International Program for Cultural Presentations," the 1958 State department tour in which prominent jazz musicians traveled to 14 countries to give 80 concerts in 90 days. This grueling schedule was endured by such luminaries as Louis Armstrong, Dizzy Gillespie, Duke Ellington, and the Dave Brubeck. For Brubeck, the inspiration was mutual, reflected in compositions that incorporated the local musical traditions he was hearing. Several of these are included on this record. Probably the most well-known is "Blue Rondo a la Turk," in which Dave melds the 9/8 rhythms of Istanbul's street musicians with American jazz and blues, creating a unique and indelible composition that has been covered by everyone from Al Jarreau to The Canadian Brass. Here, this beloved tune is freshened by master trombonist/bassist Chris Brubeck's arrangement, which begins with dazzling drummer Dan Brubeck's electric hand drumming and moves through sections that are separated just enough to highlight their different origins. This twist provides a new perspective on music that is so often played, reminding the listener of the global influences that were merged during that historic trip.